Friday 29th June 2018 - members will be arriving mid/late Friday afternoon and booking in to the hotel. Saturday June 30th and there will be a mid morning/early afternoon event (details tba) The AGM later will be held (as last year) later in the afternoon with the Gala dinner and entertainment in the evening. Sunday 1st July is the main event. 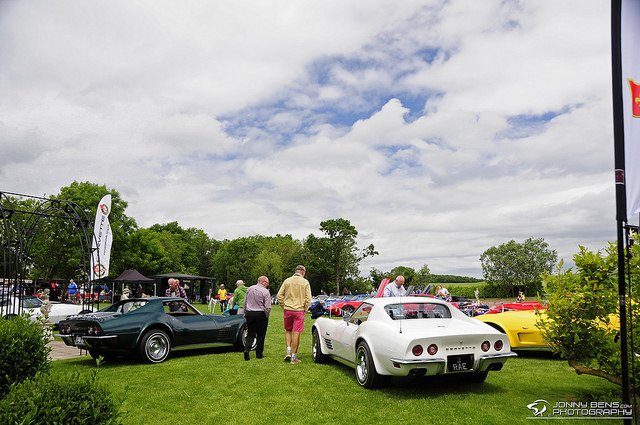 You can expect to see some of the very best Corvettes from all years over the weekend together with a display of the very best 'Flight' standard cars from the UK's NCRS Chapter. Hoping to be also showing some Vette related drag racers and others on the Sunday with our very own 'cacklefest' and a RAF 'flyover' if all goes to plan! Hi, Mike/Ross will there be space for , corvette related swap meet?? still have lodes left over from last year ie oil/spark plugs/oil filters and air/ C3 bras .....you name it I just might have it! This year entry for the Nationals for members is a one off payment of £10. This is for the members car and occupants and covers you for the whole event, and we also have a prebooking scheme as we are expecting a mucher larger number of cars on the Sunday than last year. So in order to prebook go to the hotel website for the Nationals and you will find all the details of the booking system, which not only handles entry fees, but also includes Friday night show and gala dinner bookings also. For members turning up on the Sunday only, it is advisable to prebook in order to guarantee yourself a spot in the display area. Non members pay an additional fee of £2 and have no guarantee of location. Hope this clarifies the general admitance for this year and more details will be in the next magazine due in APRIL. By using this booking system for the first time we are minimising handling cash on the gate thus reducing marshalling at the same time. Could be having (another) senior moment but can't find any link on the hotel site. It seems that the hotel have made changes on their events list and moved things around and I cannot find the details, so am contacting the hotel and will let everyone know when it will be back in place. Now you need to go directly to the eventbrite website. By going to www.eventbrite.co.uk. this will show you a location box. Enter the sharnbrook hotel in the location box it will bring up the car shows at the hotel. Click on the classic corvette club and follow the instructions. Hopefully this should work for you. If anyone does a booking it would be good to get your feedback. Any problems in carrying out the bookings regarding the show or gala dinner please let the hotel know by contacting the hotel direct. This is the first time we have used this so we hope one and all can get your bookings done. The link was very close Mike, just a few extra characters on the end. Then just search for the Sharnbrook Hotel. All members should 'hold back' from booking the Nats (just at the moment) - an update will follow on here shortly. Not a CCCUK Exclusive Evening - surely not - how does that fit with the Speeches? Members / Non Members / Vette Heads / Petrol Heads of any persuasion YES, but not sharing with people for the Abba thingy. We bring in enough revenue for the Sharnbrook that should dictate. Ps from that do we assume that we the Members may not have had priority with booking the available Rooms and some Members have had to go elsewhere away from the action.